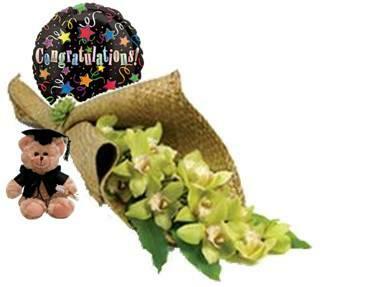 Congratulations | Graduation Gifts | Engagement | Housewarming | Best Blooms Florist Auckland N.Z. Exciting times are ahead - send them your love and support and a big cheer for all their hard work. We have the cutest wee graduation teddy bears, Congratulations grad balloons and of course presentation bouquets, to wish happy success to your new graduate. Look out for our gift sets that include candles, burners, vases and other elegant household decor, to make a perfect gift to welcome them to their new home or send them a beautiful big Welcome Home bouquet! When you can't be there, to celebrate the engagement of the happy couple, Best Blooms can help. Stylish gift packages of home decor, or a gift basket full of treats, all make stylish engagement gift ideas. Elegant engagement flower bouquets in shades of white, or happy bright celebration colours. Look below for ideas to choose a perfect Congratulations present, for any of life's special Celebrations!